This really nice Trilby Oval Celery Dish with Platinum Trim, was made by Noritake China from 1969 to 1984. This Celery measures 12 1/8 Inches Long. On the back is NORITAKE TRILBY. This Celery is in very good condition with no chips, cracks or scratches. The decoration and platinum trim is all very good. We guarantee items to be as described. THANK YOU. 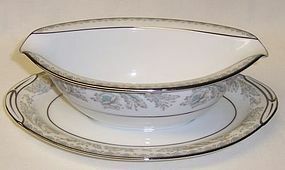 This is a really nice Belmont Gravy or Sauce Boat with attached under-plate made by Noritake China. This Gravy is signed NORITAKE CHINA - JAPAN - 5609 - BELMONT - U.S. Design Pat.Pend. It is in very good condition with no chips or cracks. The surface of the Gravy is shiny. The pattern and gold trim is really good. Be sure to search our other Belmont available. We guarantee all items to be as described. Feel free to email any questions. THANK YOU. 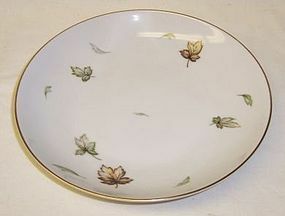 This is a really nice Belmont 10 inch Oval Vegetable Bowl made by Noritake China. 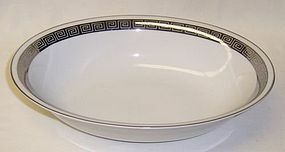 This Bowl is signed NORITAKE CHINA - JAPAN - 5609 - BELMONT - U.S. Design Pat.Pend. It is in very good condition with no chips or cracks. The surface of the bowl is shiny. The pattern and gold trim is really good. Be sure to search our other Belmont available. We guarantee all items to be as described. Feel free to email any questions. THANK YOU. This really nice Romaic Fine China 12 1/4 inch Oval Serving Platter was made by Harmony House. It is signed on the back Harmony House FINE CHINA 3671 ROMAIC JAPAN. It is in very good condition with no chips, cracks or scratches. The platinum trim is all very good. Be sure to search our other Romaic available. We guarantee all items to be as described. Feel free to email any questions. THANK YOU. 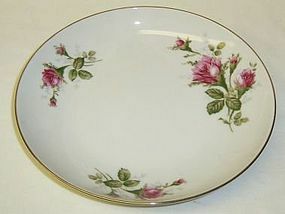 This really nice Romaic Fine China 10 inch Oval Vegetable Bowl was made by Harmony House. It is signed on the back Harmony House FINE CHINA 3671 ROMAIC JAPAN. It is in very good condition with no chips, cracks or scratches. The platinum trim is all very good. We guarantee all items to be as described. Feel free to email any questions. THANK YOU. This really nice Pattern No. 5520 5 1/2 inch diameter Fruit Bowl was made by Noritake China. The pattern is a blue, pink and yellow floral spray. On the back is NORITAKE CHINA JAPAN 5520. This Bowl is in very good condition with no chips, cracks or scratches. The decoration and silver trim is all very good. See our other Noritake available. We guarantee all items to be as described. Feel free to email any questions. THANK YOU. 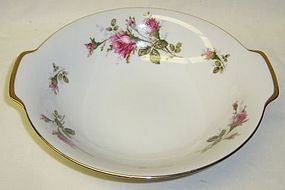 This really nice Chippendale 7 1/2 Inch diameter Flat Soup Bowl with gold trim was made in Japan for Montgomery Ward. This Soup bowl is signed on the back MONTGOMERY WARD - FINE CHINA - CHIPPENDALE - MADE IN JAPAN. It is in excellent, unused, condition with no chips, cracks or scratches. We guarantee all items to be as described. Feel free to email any questions. THANK YOU. 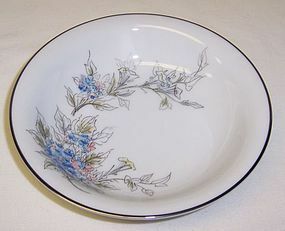 This really nice West Wind Fine China 7 1/2 inch diameter Flat Soup Bowl was made by Harmony House. This bowl is signed on the back Harmony House FINE CHINA West Wind MADE in JAPAN. It is in very good condition with no chips, cracks or scratches. Be sure to search our other Harmony House available. We guarantee all items to be as described. Feel free to email any questions. THANK YOU.